The club welcomes everyone (all ages) and looks to keep expanding so eventually the green is full on a daily basis. A huge aim is to join the ladies league but we need another 5 or 6 females to join up (most leagues are currently mixed gender). If you have any questions please message me. Please don’t hesitate, Join us today! League games are £1 per game to play but theres no obligation to play all of them, just advise your preferred times on the form and a selector will message you once a week for your availability. English bowler Bob Love practices at the Kelningrove Lawn Bowls Centre ahead of his Open Triples match tomorrow in the Para-Sport Open Triples B6/B7/B8 round 1 match, Bob uses his feet to play with after he was born without arms, during the 2014 Commonwealth Games in Glasgow. PRESS ASSOCIATION Photo. Picture date: Sunday July 27, 2014. See PA story COMMONWEALTH . Photo credit should read: Andrew Milligan/PA Wire. RESTRICTIONS: Editorial use only. No commercial use. No video emulation. * An enclosure (planted ivy fencing), no more than 1metre in height to protect the facility and help us safely look after children when invited to play in groups (fully public accessible). The club has held open days in recent years and the demand from people wanting to play the game socially is immense, when the weather has permitted the green can be full all day. Wouldn’t this be a great sight every day at the park as a spectacle to watch whilst eating your ice cream?!! We will work with the council to offer access to the facility and the equipment and make the sport accessible for all with the possibilities for carpet and target bowls! For a few years now the bowls club has been looking for a way to enhance the area of the park whilst keeping it a beautiful spectacle for the park users. Please see the picture of how the green may look and also (above) how we would like to see the green used, also some of the possible equipment that would assist us in providing a sport for all, not just the few. As you will know the sport has faced difficulties in Darlington including vandalism, bowlers being physically attacked and expensive equipment stolen. The proposed improvements aim to reduce these problems and allow the club to grow and return the game to the public as a sport and as a spectacle. The club is consulting now and ask for your constructive comments around our project. Again we stress that we have looked at many angles to make this arena complement the visual aspect of the park, and without these improvements the top bowls green is likely to become a ‘piece of grass’ like the bottom bowls green has become. Bowls is seen to many as an old man’s sport, but we can assure you that all over the country and even more so in Australia, South Africa and New Zealand this is very much not the case. We hope that the examples show how a bowls green should be used and the sport promoted. The bowls club is closing in on its 125th anniversary and it would be fantastic if this project was used to celebrate the future of the sport and not just remember the past. Thank you all, any constructive ideas that are suggested will be considered in the club’s bid, so please feel free to post positives and negatives, we will look for solutions. Also feel free to contact me with any questions. HOW THE GREEN MAY LOOK – Please bear in mind benches will be put inside and outside the arena to allow seating for those who wish to watch the bowls and those who just need a seat to eat their ice-cream. This provides instant hedging. Maintenance will involve trimming back the ivy to prevent it spreading along the ground. The proposal is replicating the wooden trellis to the opposite side of the green (with decorative planting and additional weldmesh fencing) in order to provide a decorative element that mirrors the existing border. Both lines of trellis – reinforced with weldmesh fencing – would form part of the boundary to the bowling green. South Park Bowls Club is often looking for ways to increase participation in the sport and have started a Carpet Bowls League from 8th November in the education centre at South Park. So far 9 teams have entered and 21 players have agreed to take part, 18 from our own members, a new member and 2 bowlers from Alpha Plus (North Lodge) who we are delighted to have. The aim of this is to be a fun social game over the winter, we will supplement this with further social activity, hopefully Casino night, archery and a quiz night on top of our summer Quoits night (all being well). If you would like to get involved please contact us! 2017 Sees a 121 year old club making big steps to secure its future. 2017 has been a massive season in terms of securing new members. After amalgamating the 2 clubs that bowl at South Park into one we have managed to build on our efforts to raise the clubs profile. 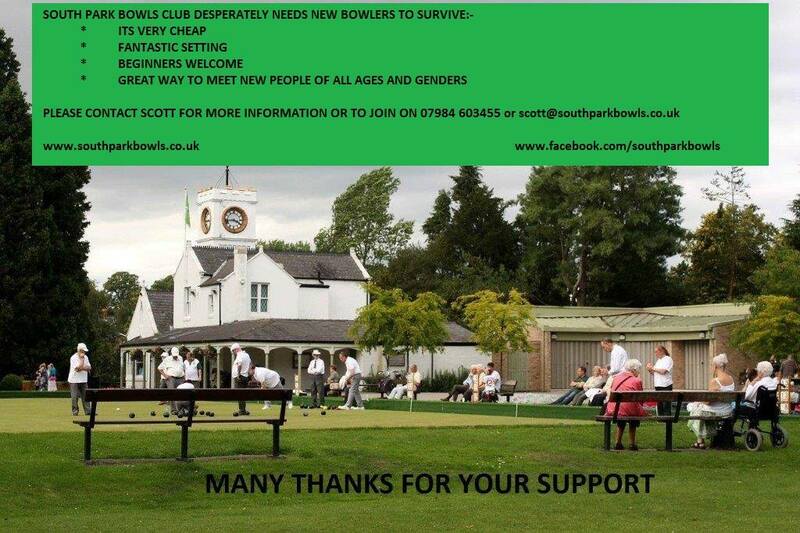 The overall aim to revive bowls at South Park and big steps are being made to achieve this long term plan. We are currently liaising with Darlington Borough Council and Groundworks to try and get an enclosure around the bowls green. We are nearing consultation stages and have 3 designs that will be circulated publically soon. The aim is to enhance the look and help secure the bowls green both for the security of the bowlers, its equipment and also provide an arena where open days and events can be ran and controlled in an orderly and safe environment. At South Park we are currently a work in progress in terms of competitiveness, we have almost a full team of new bowlers. This is superb for the club, however it obviously reflects in results, please see final tables www.southparkbowls.wordpress.com/fixtures/. We believe that this will get better in each and every year as our bowlers develop. Congratulations this year to all club competition winners and also those who had success in league competitions. This year saw our Veterans team relegates, 2 further teams finish bottom of the table and one team narrowly missing out on promotions, but again this is not a problem as the importance of our club is to build a future, competitive success comes with time and persistence. The club is close to securing a social winter carpet bowls league to be played on Wednesday Evenings from November alongside our friends at Darlington Woodland Bowls Club. This is to be in a pairs format, again anyone interested in playing or entering a team please get in touch! Our other social events this winter are likely to be a Casino evening, and an Archery session. Again we enjoyed Quoits this year at Darlington Quoit Club and hope to again arrange this event in 2018 and invite their club to try bowls also. Thanks to everyone, the committee, the bowlers and the public for making 2017 an enjoyable bowling year. Please join us – we need you!